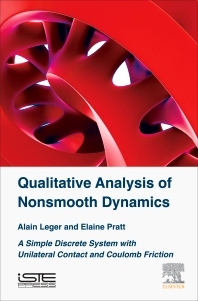 Qualitative Analysis of Nonsmooth Dynamics: A Simple Discrete System with Unilateral Contact and Coulomb Friction explores the effects of small and large deformations to understand how shocks, sliding, and stick phases affect the trajectories of mechanical systems. By analyzing these non-regularities successively this work explores the set of equilibria and properties of periodic solutions of elementary mechanical systems, where no classical results issued from the theory of ordinary differential equations are readily available, such as stability, continuation or approximation of solutions. The authors focus on unilateral contact in presence of Coulomb friction and show, in particular, how any regularization would greatly simplify the mathematics but lead to unacceptable physical responses. Alain Leger received his PhDs in Mathematics and Sciences from the University Pierre et Marie Curie, Paris. He held positions as research engineer and senior research at EDF and CNRS respectively. He is the co-manager of the International Scientific Coordination Network of 'Wave Propagation in Complex Media'. His research areas lie in the mechanics of solids and structure, unilateral problems within the dynamics of discrete systems, bifurication theory and wave propagation in complex media. Elaine Pratt obtained her PhD in Numerical Analysis in 1979 from the University of Provence. She has held the position of Senior Lecturer at the University of Provence and the University Aix-Marseille. Her research interests include mathematical and numerical analysis applied to mechanical problems, the study of contact friction and non-smooth dynamics of discrete mechanical systems.